The Colwood Driving Range on Columbia Boulevard in Portland, Oregon features turf mats and all-grass hitting stations, with multiple flags/targets for golfers to test their accuracy. By offering a variety of bucket sizes to choose from, as well as having 10 bucket driving range cards available, we can accommodate everyone's level of practice. There is also a large putting green located between the range and 1st tee of our Par 3 course, so customers can also work on their short game too. *Note: Scroll left or right to view table in mobile view. 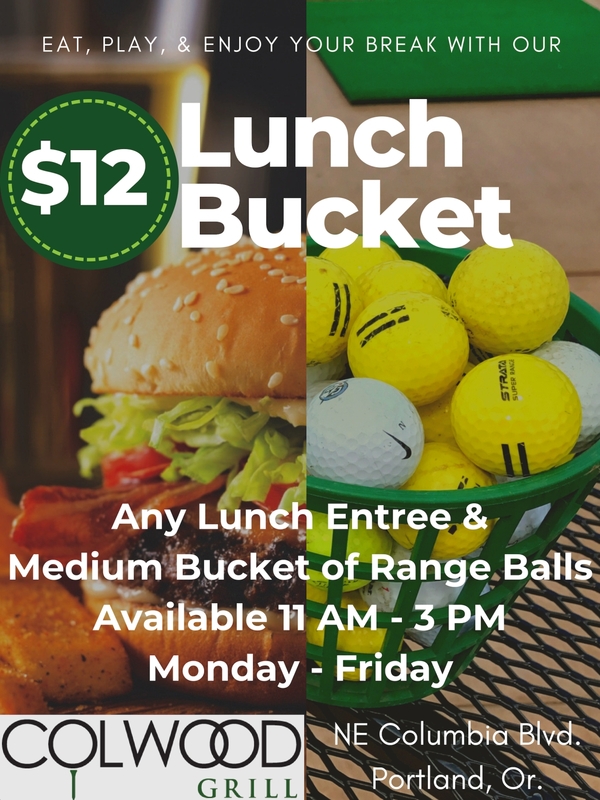 Enjoy any Lunch Entree & Medium Bucket of Range Balls for only $12. *The last range bucket will be sold at 6PM on Mondays for range maintenance and reopen on Tuesday at 8AM.